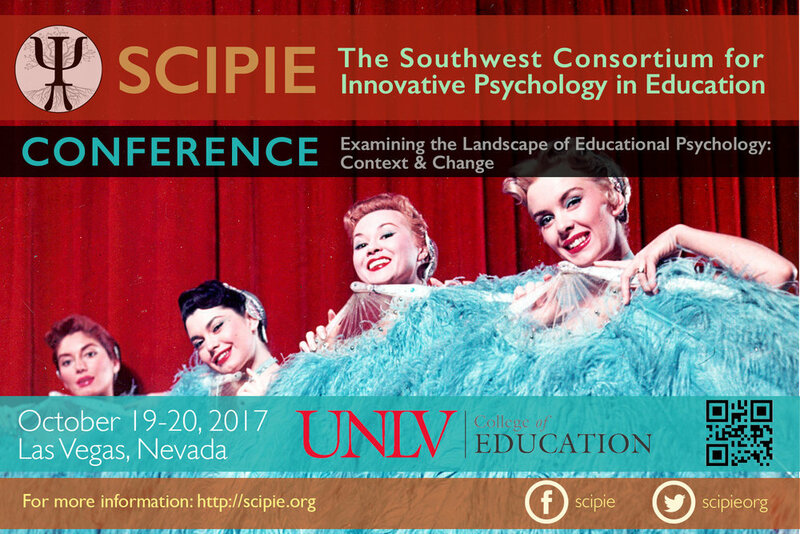 The 7th biennial conference of the Southwest Consortium for Innovative Psychology in Education (SCIPIE) was a success! The conference was held on October 19-20 at the Downtown Grand, Las Vegas, NV, sponsored by UNLV. The theme of the conference was, Examining the Landscape of Educational Psychology: Context And Change. 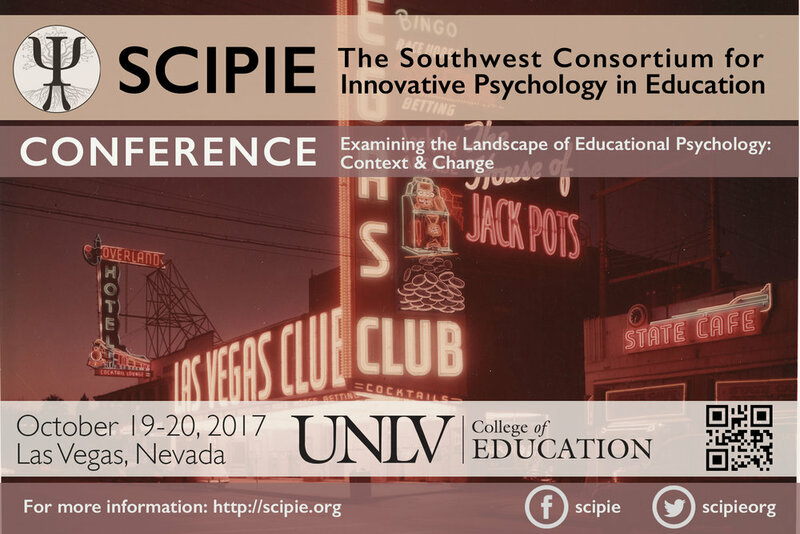 SCIPIE conferences traditionally focus on complex problems found at the intersection between education and psychology. 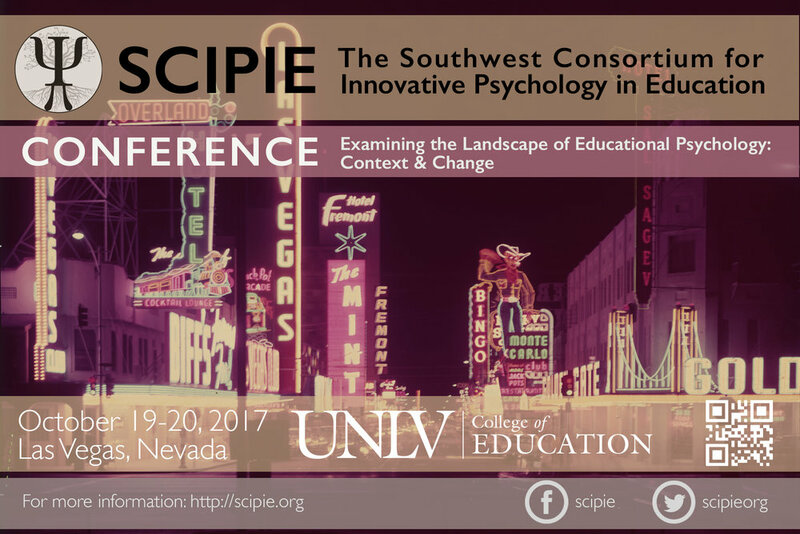 SCIPIE offers a unique conference experience due to its interactive structure coupled with an emphasis on driving theoretical and methodological innovation through exploration of tensions in educational psychology and related fields. Participants are encouraged to bring works in progress and unresolved issues in research as a foundation for session content and discussion. The conference is also geared specifically to provide early career scholars and graduate students an opportunity for meaningful participation in conference sessions. Each year SCIPIE awards a "Founders Award" and a "Graduate Student Poster Award" for the most innovative presentations at the yearly conference. The award winners are determined by a board review of the presentations. This year we had many high quality presentations, but clear winners emerged. We would like to congratulate Brandy Todd, Wendy Wakefield, and John Chancey for their terrific contributions to the SCIPIE program this year. Very well done! We hope to see you at future SCIPIE conferences! The focus for the 2017 conference was exploring the role of context and change over time in educational psychological research. These two factors add complexity that is difficult to model and require new ways of thinking to adequately address. For example, examining the role of context, and how the tensions between individual and structural forces shape and reimage the constructs we examine, can help us to better understand the experiences of underrepresented groups. Further, taking a closer look at the role of time, both how constructs change over time and how time is integrated into our theoretical models, requires some deep consideration of methodology, method, and analysis. At its heart, research in educational psychology is embedded in multiple levels of analysis, each with their own domain specific, contextual influences and patterns of change. The nature of the constructs we examine, the structure of their relationships, and the critical variables in our models shift depending upon at what level, what context, how close, and how frequently one looks. The conference theme and related discussions helped to integrate theoretical models and research methods into educational psychology that can improve our understanding educational environments (formal, informal, face-to-face, and virtual) and provide more equitable recommendations for practice and policy. We were fortunate to have Dr. Avi Kaplan as our keynote speaker at SCIPIE 2017. 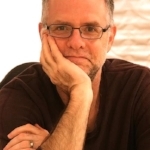 He led attendees in considering how to reframe research to more appropriately consider critical issues in educational psychology related to the conference theme. The most prominent characteristic of life in the 21st century is change; tremendous and rapid continuous transformations in access to information, modes of social interaction, technological tools for work, and overall images of the future. How adequate are our current educational psychological theories and research methods for understanding people’s motivation, learning, and development under such continuously changing circumstances? In his keynote, Avi Kaplan raised these and other questions that point to epistemological and methodological innovations that he believes we must consider in order to better capture the educational psychological phenomena we aim to understand and influence. He also suggested directions for such innovations. During the poster session graduate students had the opportunity to interact with conference attendees as well as a poster mentor. Graduate students presented research related to their thesis or dissertation, collaborations on new ideas with other graduate students, or work they have done in collaboration with faculty. Students highlighted potential innovations, showcased complex problems, and explored possible research agendas. SCIPIE offers an opportunity to find new ways to address challenges in research, explore complex problems, and explore the ambiguous space between scholarly rigor and meaningful application. We place a high premium on interactive conference sessions that promote engaging dialogue and active participation. We also seek to provide meaningful conference experiences for graduate students. Each year, we organize a graduate student poster session. Graduate students are paired with a mentor from the field and receive mentoring feedback on works-in-progress or completed research. individual submission types for graduate students to submit research posters and faculty to submit single papers to be integrated into interactive sessions. Experiential Learning Sessions: We invited researchers to collaboratively propose experiential learning sessions that address critical research areas in educational psychology. Experiential learning sessions include formats such as workshops, demonstrations, and professional development. Researchers are encouraged to collaboratively develop sessions that address difficult problems or unique solutions in educational psychology that call upon audience participation to explore the topic. We encouraged researchers to be creative in their thinking about not only what critical issues to address, but also how to create interactive sessions that are engaging for conference goers. Each session lasted one hour and fifteen minutes. Interactive Paper Sessions: We invited researchers to collaboratively propose interactive paper sessions that synthesize emergent research in educational psychology. Interactive paper sessions were composed of collections of research papers that share a common goal, theme, or method. Researcher were encouraged to collaboratively develop sessions that highlight forward thinking work in the field that can promote or inspire meaningful change. We encouraged researcher to not only consider ways to group papers, but also to be creative in their thinking about how to actively involve participation among audience members. Each session lasted one hour and fifteen minutes. Graduate Student Posters: We invited graduate students to propose poster presentations for the graduate student poster reception. Graduate students presented research related to their thesis or dissertation, collaborate on new ideas with other graduate students, or present work they have done in collaboration with faculty. The emphasis of the reception was on student work. A student was first author on all posters. Where appropriate, faculty were listed as co-authors. We encouraged graduate students to highlight potential innovations, showcase complex problems, and explore possible research agendas in their poster submissions. Participants were matched with a poster mentor as part of the SCIPIE experience. Individual Paper Submissions: We invited researchers who wanted to attend the conference but are not a part of a collective submission to submit individual papers for presentation. Individual paper proposals were led and submitted by faculty members. Graduate students submitted to the poster session, though they could contribute as a co-author on an individual paper. Individual paper submissions were fully developed, with data, method, or models in place. The papers represented innovations in educational psychology that were related to the theme. These submissions were grouped with other, similar proposals to create complete sessions. SCIPIE officers grouped the paper sessions and worked with the authors to create interactive sessions related to the emergent themes.